I had been working on something that I kept referring to as 'secret'. the reason is that it was a Christmas present for a friend in Connecticut, USA and he reads this blog so i couldn't feature it until he had received it. The model is a Revell Shelby Mustang 350. Dan is a big fan of Funny Car dragster racing. Quoting Dan, "The paperwork talks about the "B" class in SCCA racing but these things were all over dragstrips of the '60's. They were referred to as "altered", a racing class that eventually morphed into Funny Car, which is the class I follow today. So, it was a perfect choice"
Once that was done, I used Alclad lacquers (http://www.alclad2.com/) to respray all of the metal finishes. There is a combination of Steel, Chrome and Aluminium (sorry - Aluminum) used. The clear parts were dipped in Pledge Multi Surface Wax Finish!. This fills in all the little pits in the plastic and makes the glass gleam. For those in the UK, this proves that the new product is functionally the direct equivalent of Johnson's Klear and you should not hesitate to purchase the new product if that is all you can get. It isn't actually clear - it is a little cloudy but this doesn't affect the final finish on the model which is as clear as Klear! There were no seat belts in the kit so I made up a set of 5 point belts. I lost the decals for the headlight treatment, which is a criss-cross of black masking tape. So, I did the right thing - I painted some masking tape black and made up the protection in the same way as the original. Lastly, the whole body was sprayed with Johnson's Future to give it a good gloss finish and then polished. It then went in a box and got shipped by airmail from Ipswich in the UK to Windsor Locks CT. It seems to have arrived in good condition. I have had problems recently when airbrushing with Life Color. For some reason I don't seem to be able to get the consistency right. I started out on the Hobby Boss F-15 but when it came to painting the aggressor scheme camo, I made a right mess of it so that is gone!. Dan, I will do another one. I am determined to make a good job of one aircraft so I have gone for the big one! The Monogram PBY Catalina is a large kit and the attraction is that it is actually a post-war OA-10A air sea rescue plane. I have wanted to do this for a long time because couple of years ago, I got a 1/144th version as my Xmas kit at the Colchester club. This model has had a pride of place in the shop since then. When the Monogram kit was re-released, it had the same aircraft on the decal sheet so I felt I had to go for it. Now back to the heading. 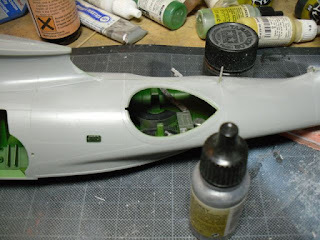 I have always felt that there was no point in pre-shading - a process whereby you spray a dark pigment along the panel lines and then put on the final coat. I always felt that you would lose the shading. However, I tried this on the bulkhead behind the cockpit and found that I could get it to work. The effect is achieved by first spraying Life Color Tensocrom Smoke. I then sprayed the final green using very low pressure with the nozzle very close to the part. I was using Vallejo Model Air which I find that I can spray at close quarters much better than I can spray Life Color. I think the the final result looks great. I have also included the two seats. 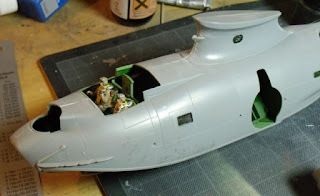 however, I am planning to make this a model in flight so I will be putting two pilot figures in the seats.